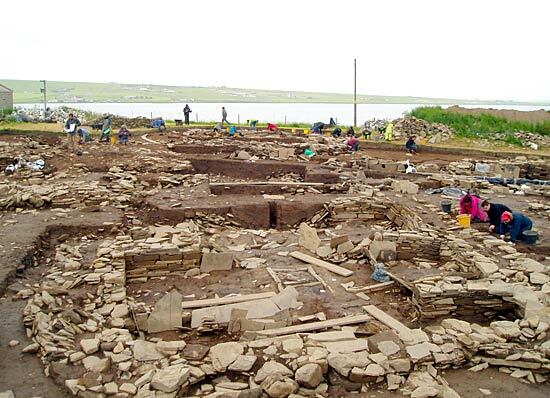 A hive of activity as the southern end of Structure Twelve is spring cleaned in preparation for some real excavation. 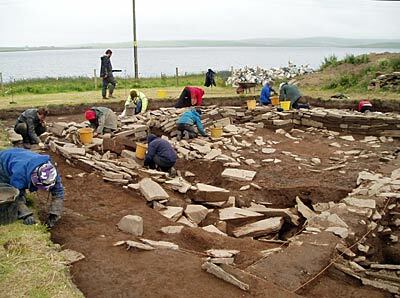 Day two at the Ness has started and the hearts of the team are on a high as the last of the sandbags have been removed and we can get down to the proper business of archaeology. It was a major achievement to get to this stage so quickly, so hats off to all the team for putting in such a sterling performance in this, the less than glamorous side of excavation. After a brief overview of the excavations from site director, Nick Card, the team was set to work on doing an initial overall clean of the trenches, removing weeds from sections and generally sprucing the site up for our first official public tours tomorrow. Hats off to the Ness Team – cleaning of Structure Twelve. But although the official tours only start tomorrow, the site is already attracting visitors and there is a steady stream consulting the new information panels (kindly provided by Historic Scotland) and making use of the viewing platform. 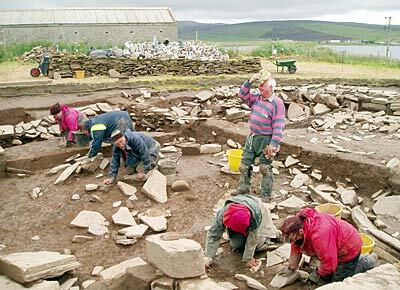 Despite the fact that we are only on our second day, already the splendour of the site’s buildings is beginning again to show itself as wallheads are cleaned and the intervening midden deposits are brought back to life with a brisk trowelling to enhance and clarify their myriad of autumnal colours that signify separate deposits. The finds supervisor, Anne Billing, has instructed all the site newcomers in the processes involved when a find is made – the filling in of labels, ensuring that correct information is put on the bag – context number, structure number, material etc. And with over 3,000 finds last year, one can imagine the chaos that might ensue in the overall post excavation process if human error crept into the process at this early stage – and how each find is three dimensionally recorded. With the end of, in terms of the Ness, a fairly uneventful day, the weather is beginning to close in with a steady drizzle – so roll on tomorrow, with better weather and promises of some spectacular discoveries. My name is Jenna, and I have the honour of entering our second dig diary. Day two at the Ness (if you count a full day of clearing plastic sheeting, stones, and sandbags) and we have started to scrape away the top layer of mud to get a better view of the site. I say “mud” because the weather has been cold and wet. Nevertheless, everyone here has a smile on their face and is having a laugh getting to know each other to help pass the time. It is obvious that everyone involved with the project this year is excited to be here from the amount of work that has already been done. With the site completely open and the trenches in full view, it becomes a reality of the past that stares us in the face. With trowels and buckets in hand, we hop into our designated areas and begin to find burnt bone, worked flint, as well as pottery fragments. Looking around at the landscape as we work is a constant reminder of the sheer importance of where we are standing/kneeling, as we are surrounded by the Neolithic giants of the Ring of Brodgar and the Standing Stones of Stenness. Being a student from UHI, down in Moray College, this is the opportunity of a lifetime and I look forward to what the next two weeks hold for me and the rest of the Ness crew. Looking more and more like an archaeological site as initial cleaning progresses.